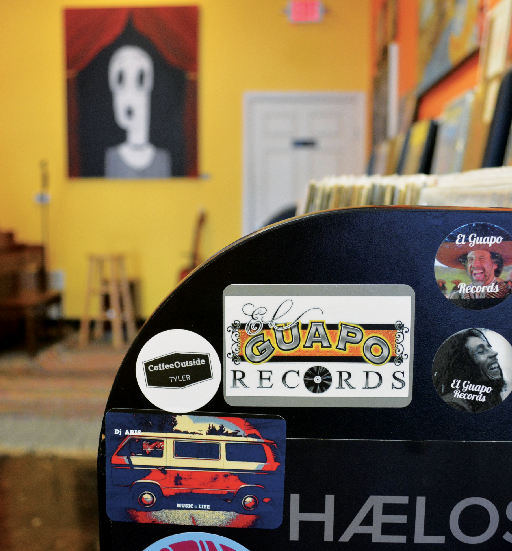 Tucked away downtown near The Lightbox Collective is El Guapo Records, a locally owned record store. While the shop may be hard to locate at first, one may find it’s worth the search once stepping inside. The owner, Aristeo Rodriguez, otherwise known as A-Rod, greets everyone that walks into his shop, providing a welcoming and friendly atmosphere. The orange and yellow walls are covered with art pieces created by local artists, while at the front of the shop, one could find local musicians’ and artists’ merchandise. Locals are able to showcase their work at the shop without paying a shelf or commission fee. Rodriguez feels that his shop provides opportunity to locals that they might not find anywhere else. Rodriguez has been involved in music just about all his life. From being a part of his school’s band program, to being in his own band, music has played a major part in making him into the man that he is. He’s even been DJing since the late 90s. Rodriguez feels that music plays an important role in everyone’s life. By connecting this way, Rodriguez feels that social barriers can be broken, making it easier to get to know other people. “These guys come in, you become buds, you become friends; and it all started because of music,” said Rodriguez. Ian Power, a local musician and TJC alumni that participates in El Guapo’s events, feels that the opportunities provided by the shop gives people the chance to embrace their creativity. Power has embraced the creative outlets provided by El Guapo by performing his music and attending Spoken Word, a poetry reading hosted by the shop. Locals have the chance to express their creativity in their own way by attending Spoken Word every other Wednesday. Spoken Word is free to the community and is open to all ages. Sign up starts at 7 p.m. and readings begin at 7:30 p.m.
“All you have to do is show up and just do your thing,” said Rodriguez. Locals also have the chance to practice their piano skills and guitar skills since the shop provides one for people to use while they’re there. Another way El Guapo reaches out into the community is by participating in block parties. Just like Spoken Word, the block parties are free for all ages and typically take place near the end of each month. In the end, Rodriguez’s goal is to simply play his part in enriching Tyler’s community. “It’s awesome to see … people come in here with their kids and teaching their kids about records. And they’re like ‘Yo, look I did this as a kid,’ or they’re like, ‘Hey, I did this with my dad,’” said Rodriguez. Rodriguez feels that this helps to bring families closer. “[I watch] the families that come in here and buy records and buy a brand new record player for the first time. And then they go home and send me a post over Facebook and they’re like, ‘Thank you so much. We didn’t watch TV tonight. We had dinner, played some boardgames and listened to records. We’ve never done that,’” said Rodriguez. Playing his part in helping families connect is what makes Rodriguez’s job all the more worthwhile. By not having Wi-Fi, Rodriguez believes that the communication between customers in his shop will grow. El Guapo is always open to new ideas.